Carte des Parties Nord et Ouest de l'Amerique Dressee d'apres les Relations les Plus Authentiques par M *** en 1764. A truly remarkable 1772 map of North America by Robert de Vaugondy. Based upon an earlier map of the region by Thomas Engel, this is a fascinating examination of the general layout and waterways of North America – especially in the west. Curiously does not specifically show a Northwest Passage, but leaves clear the possibility that one such passage may indeed exist. Rivers and lakes extending from the eastern part of the continent almost, but never quite meet their counterparts from the west. While the east is displayed with reasonable accuracy, the cartography of the western part of North America is almost entirely conjectural and based upon early reports from Jesuit missionaries. Six largely mythical river systems extend inland from the Pacific or, as it appears on this map, 'Mer du Sud.' Several meet with enormous and interesting mythical lakes. The northern most of these is Lake Conibas, the center of a supposed lake region that first appeared in Mercator's 1569 map of America. Mercator's version of Conibas been loosely interpreted, depending upon the source, as the Northwest Passage, the Hudson Bay, or the first map of the Great Lakes. Vaugondy situates this region is further west, making it the source of several river systems and a potential station in a 'northwest passage.' Another lake, further south is labeled the 'L. des Tahuglauks.' This lake, which is shown as the source of the mythical 'River of the West,' was first reported by the French traveler Baron de Lahonton, who claimed to have traveled in this area in 1702. After traveling westward along what he called the 'R. Longue,' which is shown, he claims to have arrived at the city of Moseemlek. There the local tribal peoples reported the existence of a large salt water lake to the west, possibly an early report of Great Salt Lake. 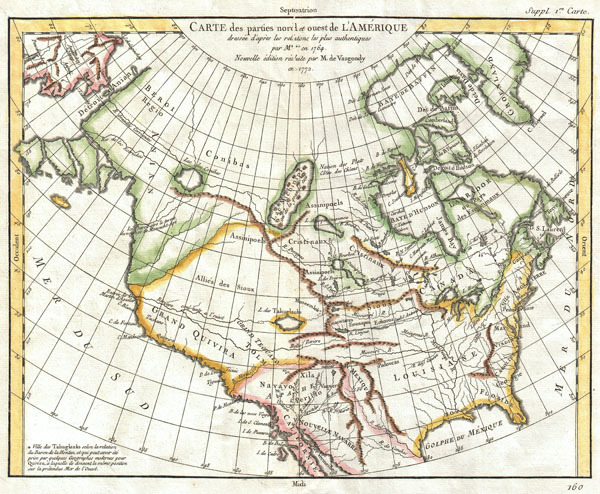 Back in France, De L'Isle added the lake to his map of North America and, later, Vaugondy included it on this map. There are also a number of interesting political features. The region that roughly corresponds to modern Alaska is labeled Anian Regnum. Here is a real cartographic curiosity, where myth become fact, which again becomes myth. Anian is a term derived from the journals of Marco Polo and its first cartographic appearance is in a 1561 map by the Venetian cartographer Bolognini Zaltieri. Later it was popularized in a John Donne poem, 'Anyan if I go west by the North-West passage.' However, it was interpreted as the Bering Strait by cartographers, successfully transitioning it from the realms of poetry into cartography. Anian presupposed the existence of a Northwest Passage and, as such, was entirely mythical, though the lands that are now Alaska long bore that name. Further south we find 'Grand Quivira' referencing one of the many mythical Kingdoms of Gold. Much of the west is labeled 'Allies des Sioux,' an idea mostly probably derived from Jesuit missionary reports. Greenland is shown attached to the mainland. All in all, an extremely attractive and important late 18th century mapping of North America. This map is part of the 10 map series prepared by Vaugondy for the Supplement to Diderot's Encyclopédie, of which this is plate 1. This seminal map series, exploring the mapping of North American and specifically the Northwest Passage was one of the first studies in comparative cartography. Very good condition. Wide clean margins. Original centerfold as issued. Original platemark. Blank on verso. Pedley, Mary Sponberg. Bel et Utile: The Work of the Robert de Vaugondy Family of Mapmakers. 453. Portinary, Pierluigi and Knirsch, Franco, The Cartography of North America 1500-1800, #155. Wheat, C., The Mapping of the Transmississippi West, 1540-1861, 158. Kershaw, Kenneth A., Early Printed Maps of Canada, 1133. Phillips (Atlases) 1195-1.